The last decade has seen many exciting advances in connectivity accelerated by the near universal availability of smartphones and tablets – leading to a highly interconnected world. The security of networks - and the businesses and individuals that rely on them - has become top of mind for the IT Security professionals who are responsible for ensuring the safety of the data and the networks where this information is utilized. As high-visibility security breaches occur - affecting ecommerce, banking, retail and other industries - the critical importance of the security of the infrastructure these businesses rely on continues to grow. Security in the workplace is a daily fact of life. Fromusing ID cards to control physical access, to entering passwords to join the network, to using software to monitor and prevent unauthorized access, all are routinely used to protect critical assets and information. However, there is one key area where manyorganizations still have potential vulnerabilities. This is where networked devices (including printers or scanners) connect to the network; in this instance, relying on perimeter-based security alone is not enough to protect the network or a company’s critical data. Developing and implementing proactive security policies, while simultaneously being challenged by a variety of threats creates a major dilemma for IT Security professionals. This is further complicated by having to outwit the next threat while managing to comply with many different standards and regulations. 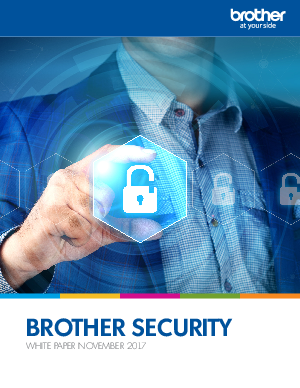 Brother offers IT Security professionals a number of solutions. Whether developing a proactive policy based on the CIS 20 Critical Security Controls, or complying with regulation standards such as PCI DSS, or HIPPA, Brother can help address your security concerns and objectives.